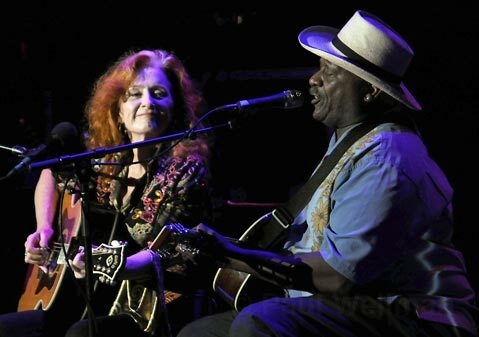 Bonnie Raitt (left) and Taj Mahal dished out solo sets before jamming together during their Saturday-night Bowl show. The Bowl was jumping on Saturday night for the Bonnie Raitt and Taj Mahal double bill. Both are veteran artists with big, outgoing personalities and tremendous musicianship, and on this tour they share a dedication to letting the good times roll in a distinctly soulful, classic rhythm-and-blues idiom. Dressed in a blue shirt, black pants, and a white straw fedora hat, Mahal opened with a 45-minute set that showed off his powerhouse band and some super-tight Texicali horns. Having traveled all over the world developing his many styles of music allows Mahal the luxury of mining the past and still sounding absolutely contemporary. He may have been singing about Annie Mae and her big-leg grandma or playing the banjo, but he was never out of touch with the audience or the groove. The final song of the set, an instrumental called “711,” was as delicious as anything cooked up by The Meters or the MGs, with Mahal front and center with his hollow-body electric guitar battling the organ. Bonnie Raitt came out for her set and continued down the rocking road Mahal had opened, covering some of the same vintage territory in a kind of Stax/Memphis meltdown. After telling everyone present, “Taj got my blood boilin’ hot,” Raitt proceeded to play spectacular guitar and sing like an angel, even as her between-songs patter took a mischievous turn. At one point, she even name-checked her bandmates’ girlfriends for showing them some pre-concert love. Keyboardist Ricky Peterson filled the night with steaming organ riffs and joined Raitt as a second vocalist on several occasions. The long Bonnie Raitt solo set bled into a jubilant jam session that brought out all the players from both bands until there were some 12 musicians onstage, as well and Raitt and Mahal. The version they offered of Mahal’s classic “Satisfied and Tickled Too” was sublime, and included a verse in which the singer growled out some suggestive wordless lyrics. “Something to Talk About” followed, as did a pair of dedications to S.B. music industry legend Hale Milgrim and his wife, Annie, and then it was down the hill and onto Milpas Street for an awestruck, happy crowd.